The 1940s aren’t usually the first decade that comes to mind when you think of amazing style. The classic 1940s look is a collared and belted smock dress, not a dress most women in 2018 would feel comfortable or confident in. But behind the mid – length skirts, a revolution was brewing. In the midst of World War II, women had to start doing traditional men’s work, work that required a different wardrobe than your every day frock. 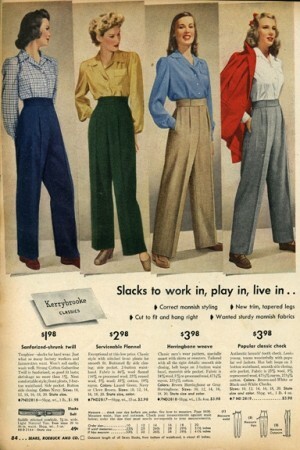 While their husbands were away, women began to alter their pants with pleats to best suit their new jobs. While it wasn’t the first time in history women worked their way into slacks, the war created the conditions that made them acceptable women’s wear. Women began wearing their modified clothes not only to work but also in the streets, and they started slipping into the modern wardrobe. They weren’t the skinny jeans we flaunt today; they were high waisted, and baggy at the bottom, true to the original men’s pants. They were often worn with tucked in collared blouses in a variety of solid colors. 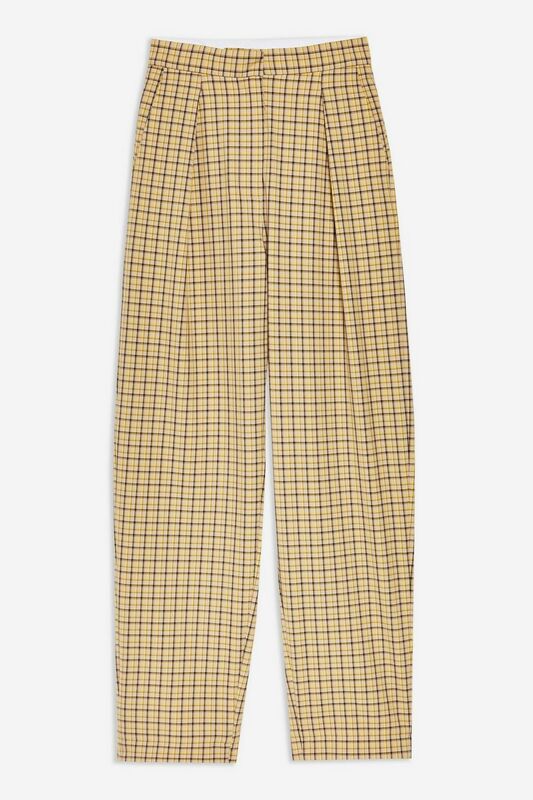 Usually we modern women wear pants that fit snugly, but spare a thought for the style that made pants a sartorial staple. 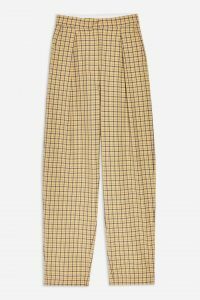 High waisted trousers with a straight, sleek leg are chic and flattering and can be found at most high street retailers. These days they come with different belts, patterns and other flourishes that make them a little less dowdy. I chose two pairs of gorgeous pants, one with a crop leg and buttons up the front. The other is a bit more relaxed with two pleats and a delicate checked pattern. I chose one top to go to with the black pair of trousers. 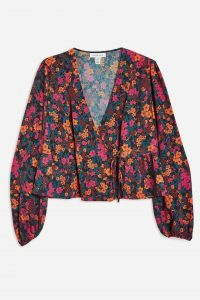 It mirrors the 1940s style when it comes to the sleeves, but there’s a modern flair with the deep V in the front and bold, colorful print. You could add even more of a modern flair with a crop top, or get comfy with a plain long sleeve tee or jumper. To accessorize whatever outfit you do come up with, take a page out of Rosie the Riveter’s book and fashion a headband out of a scarf, or tie the scarf around a ponytail. Scarves can add color, pattern and refinement to the look. As far as shoes go, get creative. Today we have many more options than women did almost 70 years ago. From loafers, to stilettos, to Doc Martens or Converse, any type of shoe can suit these versatile trousers. Whatever you wear, wear it with confidence. Wearing pants might seem trivial, but women before us fought for the right to save us from the confines of skirts and dresses.